Media: Soft, glossy, laminated card, colour covers; A4 portrait format on 136 semi-gloss pages (8 in colour). Includes 18 colour artworks and 195 photographs. Advantages: Excellent study of probably the Royal Navy's most elegant jet fleet fighter, by the people who flew and operated them. Outstanding collection of mainly unpublished black and white photographs. 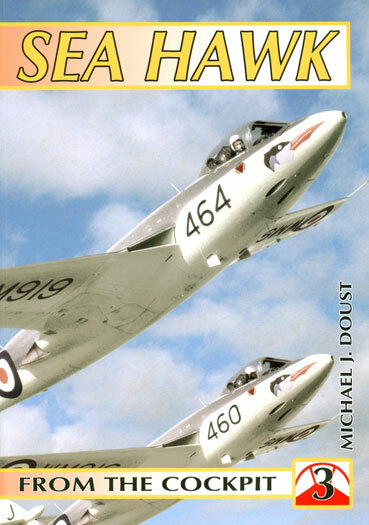 Volume three in this rapidly expanding series (the fifth to be published), concerns Hawker's superlative Sea Hawk, perhaps one of the most popular and attractive Fleet Air Arm aircraft of the postwar period. Ad Hoc's 'From The Cockpit' series is rapidly developing into an impressive reference of British naval aviation, distinguished by the unquestionable knowledge and experience of their authors and contributors. Once again, it is the respected postwar Royal Navy aviator, Commander Michael J Doust, who returns to 'pilot' us through the story of this engaging aircraft. Following the, by now, well-established format, seven chapters explain the key aspects of the aircraft's design, development and service history. The author's words in each chapter, are accompanied by the personal recollections and experiences of former pilots, engineers and specialists, and these are complimented by the exceptional black and white photographs, many of them unpublished, which we have come to expect from this series. As with the preceding published volume (Buccaneer S.1), colour also makes an appearance, with four pages of colour photographs including a two-page spread of Sea Hawk 'WV908' of the Royal Navy Historic Flight, making a total of 195 photographs in all. There are also four pages of colour artwork profiles (18 in total) covering various service aircraft, including a two-page spread of Sea Hawk FB MK.3 'WF299', as flow by the author with 738 Naval Air Squadron RNAS Lossiemouth, in the spring of 1955. After an inauspicious introduction to jet naval aviation with Supermarine's Attacker, the Royal Navy's next 'mount' proved to be everything that it was not. Acknowledged as a 'pilot's aeroplane', the Sea Hawk's compactness, maneuverability and vice-free performance, made it an excellent aircraft to fly as well as an extremely effective weapons platform. Evidence of this, can be found in the numerous front and second-line squadrons, plus training, reserve and civilian units, with which it served. Final confirmation of this aircraft's prowess in the air, can be seen in the many squadron display teams which appeared during its career, exemplified by the fact that the Sea Hawk lays claim to being the first aircraft, anywhere in the world, to have been be able to produce 'smoke on demand' during a major display. Once again, Ad Hoc has produced a welcome addition to the history of British naval aviation and once again, they have succeeding in conveying the experience of the aircraft from the pilot down to the maintainers. Undoubtedly though, it is the superlative photographs which make these titles stand out and this book is no exception. Casual readers, modellers and historians alike, will find much to interest them here.